Medicine has its own little collection of aphorisms–pithy sayings that often get trotted out to try to explain or discount patient behavior. These aren’t limited to variations on Occam’s razor, but they often work to suggest that the simplest explanation is best. On more than one occasion, I have been subjected to a paraphrase of Dr. Theodore Woodward’s directive: “When you hear hoofbeats, think of horses not zebras.” This is generally taken to mean that the physician should consider the most common diagnosis first, rather than an exotic one. I suppose this is good advice for the medical intern, or the harried ER doctor, but what happens when it is a zebra, and not a horse? Or two zebras? Or a herd full of zebras? 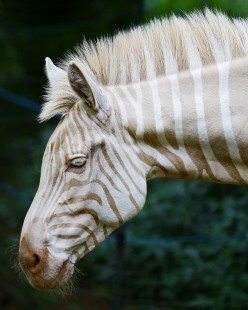 Or an albino zebra? All of this is on my mind today because I saw my rheumatologist earlier this morning to discuss my unsuccessful attempts at tapering off of prednisone. I had hoped Kineret would be my magic bullet– and it has been for my inflammatory arthritis (which meets the diagnostic criteria for RA, but is likely a variation of TRAPS and/or AOSD). However, as it turns out, lupus is still lurking in the shadows, and was all too happy to make an appearance once the prednisone shield came down. So back up the prednisone dosage goes. At this point, I wish I were better at grappling with uncertainty. If nothing else, chronic illness forces you to relinquish the illusion that having a diagnosis is an end point. It’s really just the beginning, and always subject to revision. As my doctor said today, my symptoms could be entirely different in five years. So I do my best to focus on now, and on what will allow me to have the best quality of life–to flourish–now. If it means prednisone today, it means prednisone today. Maybe later it will mean Imuran, CellCept, or Benlysta. Maybe research into autoimmune and autoinflammatory diseases will reveal new causes and new treatments and I will end up with an entirely different diagnosis altogether. It’s so easy to be discouraged, but then I think back to how miserable I felt when I was first diagnosed, then when I was on methotrexate and Arava with the added trauma of losing half my hair (and sometimes what felt like half my mind), and it’s easier to see how far I’ve come. A few milligrams of prednisone isn’t the end of the world. Diagnoses are a means to an end. It doesn’t “please” me to have more than one rare disease, but if I’m a zebra, I’m a zebra. I didn’t choose to be the exotic one, but really, who would choose to be a horse when you could be a zebra instead? Happiness Question: Do you consider exercise to be a treat or a chore? While I might have considered exercise a chore in my life before my Lupus/RA diagnosis, it is now definitely a treat. While once-upon-a-time my aspirational images came from glossy fashion magazines, I now gaze longingly at the running, stretching, dancing, and climbing women in magazines like Self and Women’s Fitness (the same smiling women who can be out in the sun without a hat, long pants, and long sleeves). I flip through the Athleta catalogue, mourning the days when I had enough energy to run 12 miles and go to three yoga or dance classes in a week– which is to say, meet the guidelines for 30-60 minutes of exercise per day. I have the schedule for my local dance studio open in my browser, just on the off chance I feel up to a yoga or ballet class (this actually happens about once every six months.). I’m lucky that I haven’t gained more than a couple of pounds on prednisone, but that doesn’t stop me from grieving from the active, capable body I used to have. Those of you who have been following this blog for a while may remember my cranky response to a small study on exercise and RA patients that received a lot of media attention last winter. The conclusions of the study authors seemed to suggest that RA patients as a whole were less active than the general population, and that this was the result of their attitudes and beliefs about the benefits of exercise, not their pain level or ability to exercise. The mainstream media took these conclusions and ran with them, trumpeting headlines like “2 in 5 RA Patients Sedentary.” This is, in my opinion, a gross oversimplification of some complex findings. One, RA patients, when grouped by age, are only slightly less active than the general population. Two, the findings in the study are skewed by a large number of older patients, a population that a) tends to be less active in general; and b) includes many individuals who received an RA diagnosis during the 1980s (or earlier), when the general consensus in the medical community was that exercise was more harmful than beneficial to joints affected by RA. So rather than trying to shame all RA patients into more exercise, which downplays the fact the many RA patients continue to deal with pain and fatigue, even once they reach so-called “clinical remission,” I think the study suggests that older RA patients need outreach to encourage them to be more active. The rest of us who want to exercise and can’t? I don’t know what the solution is, except better treatment options and access to those treatments, less reliance on broad-spectrum immunosupressive drugs like methotrexate that sap energy, and more access to gentle exercise modalities like swimming and tai chi. I’ve always been an active person, if not an intensely athletic one. I played soccer as a child until I was sidelined by arthritis in my ankles and knees in my teens. I continued to dance, on and off, into my late 20s, and I took up running and hot yoga during a particularly energetic period in my mid-20s. But now fitting in exercise requires a complex balancing of my time and energy. In order to find the energy to spend 30 minutes on the elliptical machine or in the pool at the gym, or attend a gentle yoga class, I have to take into consideration that it will probably sap the rest of my physical energy for the day. I weigh questions like “If I go to the gym, will I have the energy to prepare myself food, or catch up on housework when I get home?” “Will the benefits outweigh the inevitable pain?” Most days the answer is no, and I must prioritize my basic needs above exercise, which has become a luxury. (I have begun to count “doing laundry” as a form of exercise—there are two flights of stairs involved). While I have had peaks and valleys of energy during the past two years, my average leans more toward “fatigue”. I hope some day I will find a treatment that allows me to return to the realm of the athletic. In the meantime I eat well, but I wear my yoga pants at home and gaze longingly at the Athleta catalogue from the couch. How do you stay fit with chronic illness?